FloorTech Group – What Causes Moisture-Related Floor Failures? Now THIS is a moisture problem! Sometime around 1984, asbestos and solvents were banned from flooring materials and adhesives. Since then, moisture in slabs has become one of the most difficult issues facing facilities and specifiers that utilize non-breathable (vinyl or rubber) floors. Prior to the ban, the adhesives used for installing flooring products contained solvents, which when they evaporated or “off-gassed,” were incredibly resistant to effects from moisture. The solvents were critical to the adhesive, because they were the magic ingredient that allowed the installer to actually spread the adhesive. During the flooring installation the solvent evaporated, leaving just the glue, which was unbelievably tenacious in keeping the flooring materials permanently and completely adhered. Today, water has replaced solvents as the “magic ingredient” in most adhesives, making them usable and spreadable. That means the glue, the component that actually makes the material stick to the surface, is carried in a water base. If water is the agent making the adhesive usable and spreadable, it’s no wonder that the adhesive is susceptible to moisture. This moisture, in the form of gas (called moisture vapor emission or MVE) moves upwards through the slab. When this moisture gas is blocked by a non-breathable flooring material (like vinyl or rubber) on the surface of the concrete, it condenses from a gas to liquid, gets drawn back into the adhesive, and basically re-liquefies – or more technically, re-emulsifies the previously “cured” adhesive. This is the point at which you see bubbles, buckling, seams oozing and you have a failed floor! So you ask . . . “What causes moisture vapor to move through a slab causing these problems?” Moisture vapor drive is created when a combination of very simple atmospheric conditions (mostly temperature and humidity) interact with a concrete slab that is by its nature permeable. When the temperature above the slab is higher than the the temp of the slab and the dirt below it, moisture will be drawn (called vapor drive) to the higher temperature. Generally, the lower the humidity, the greater the drive. Now you’re surely asking, “So how can we protect ourselves against moisture-related failures?” We’ll start addressing the steps to testing and mitigation in our next post! If you have an immediate issue, call us. 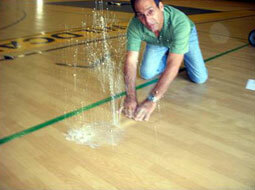 After more than 50 years in the commercial flooring business, #FloorTech DOES know how to deal with moisture!